With six people (representing thousands, I'm sure) registering their opinions, the answer was a non-definitive "stick to it." Among the "other" voters was a suggestion from sister zine librarian and for-real cataloger Violet Fox that as someone who contributes a lot of zine records to WorldCat (currently about 4,000), that I have a responsibility to zine catalogers who might copy my records, so I should "Use LCSH (except for perhaps the most egregious offenders)." The problem is that I'm feeling the egregious offense really hard just now. Library of Congress deciders recently had the chance to unfuck a fucked up LCSH, complete with a mandate from the American Library Association, and they blew it. 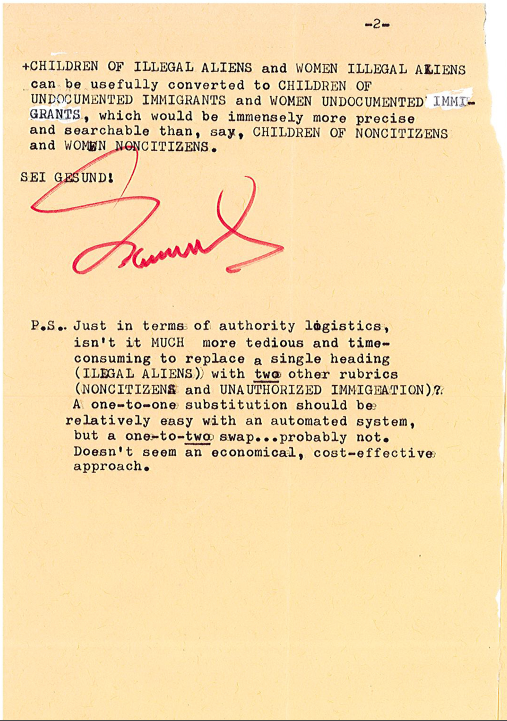 This has to do with the heading Illegal aliens, which the Library of Congress lists as new in 2003 (though a reference below makes me unsure of that date). They added Illegal aliens in literature in March 2009, Children of illegal aliens in March 2011, and Children of illegal aliens--Education in August 2011. I guess the US executive and legislative branches have been pretty immigrant hostile this century, so maybe the LC deciders were just adhering to the culture from on high. A typical LC excuse for its offensive headings is that their job is to serve members of Congress, so the headings they choose reflect Congressional language and culture. If a typical (i.e., a member of all the dominant groups in America: rich, white, Christian, male, heterosexual, cisgender) member of Congress is more likely to look for materials using the phrase "illegal aliens" than "undocumented immigrants" (which is not even a cross reference), then that's the term that must be employed. Must be. But here's the deal: academic and research libraries in the US and around the world use LC's mighty thesaurus. More people outside of Congress than inside, so shouldn't external library patrons' needs have weight at all? A proposal to change the heading to Undocumented immigrants was rejected in December 2014, mostly citing legal language. Illegal aliens is an inherently legal heading, and as such the preference is to use the legal terminology. The U.S. Code, Title 8, Aliens and Nationality, uses the terminology "illegal aliens." This very excuse gets at why I'm thinking of dropping LCSH from my cataloging practice. Changing things one heading at a time (on the rare occasions you succeed) is not meaningful when the system is problematic. We shouldn't be using the U.S. Code as a warrant if it's xenophobic. Warrants cited for many headings come from sources that reflect publishing industries that reinforce dominant cultures, and with them systemic oppression. The works I'm cataloging, zines, are usually created by women, and young women at that. They are often created by queer women, and in smaller numbers they're by women of color, people outside the gender binary, and women with disabilities. 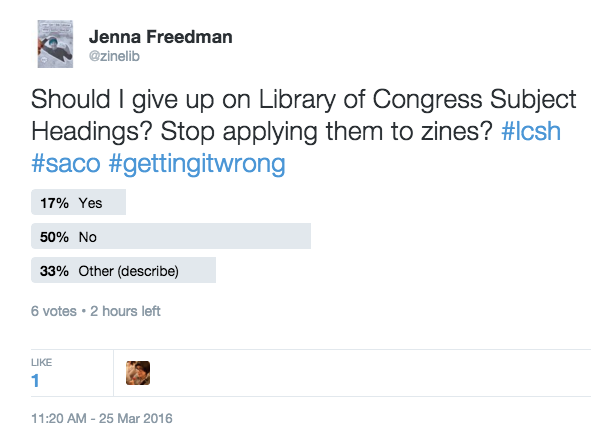 The zines are typically informed by an anarchopunk political and social ethos that I would venture to say is not highly represented in the House of Representatives. The composition of Congress is not LC's fault. I do think they could claim a little more agency to be reflect US culture than they are, even if I don't expect them to entirely adopt zine girl sensibilities and send out their monthly updates on Hello Kitty stationery. Tina Gross submitted the Resolution on Replacing the Library of Congress Subject Heading “Illegal Aliens” with “Undocumented Immigrants,” written in collaboration with others (and with input from Sandy Berman), to the Social Responsibilities Round Table(SRRT), which voted to bring the resolution forward for consideration by ALA Council. Members of REFORMA,EMIERT, and SALALM helped spread the word and garner support. The resolution was also supported by the Intellectual Freedom Committee (IFC), the Intellectual Freedom Round Table(IFRT), and SAC, and it passed at ALA Council nearly unanimously on January 12, 2016. My read is that they couldn't lose face, reversing their decision from December 2014, so they chose alternatives to the preferred term of the people being described, terms that are not quite but nearly as offensives as "illegal aliens." These terms feel like a slap in the face. Good on you for being defiant, LC, but you're defying the wrong people. I already supplement LCSH in zine records with keyword rich, vernacular summaries, due to the inadequacy of the fixed headings, both in general, and for my specific purpose. So, am I done with Library of Congress subject headings? I might be, but I'm also caught up in having used them for a long time, and in fact enjoying the game I play, simultaneously critiquing and employing LCSH. Tell me what you think! I had to turn off comments because I haven't figured out how to deter spam in my new CMS, so yap at me on Twitter or email me, and I'll add your comments to this post. I agree with you for the most part—I’m a part of the SAC working group on suggesting appropriate replacements for “Illegal aliens”, and while I’m glad that LC made a change, I’m disappointed with the way it was carried out, and not a fan of the terms they chose. I know other catalogers would say your primary obligation is to your local users, but given that there are few zine-collecting libraries/archives, and even fewer who are able/willing to do item-level description, I think your descriptions (and subject interpretation) go far beyond your institution. The other part of my suggestion in that linked tweet was to “use local terms for discoverability as you see fit”. I still think that using local terms when LCSH isn’t appropriate—and, even more importantly, fighting for better, more respectful headings and a more open process of LCSH change—is a preferred solution to not using it altogether. I value your contributions through the years and would be disappointed to lose your voice arguing for change. Apologies to Violet for misinterpreting her tweet! I am writing this in gaps between meetings, so sorry if anything is muddled. :) First, a thought/observation that is primarily a joke… I can't help musing to myself if this dilemma is comparable to thinking of moving to Canada because the US has become too reactionary. I'm not sure it's a valid comparison, but certainly part of my engagement with these LCSH efforts is based on some kind of fighting-the-good-fight-in-the-belly-of-the-beast sentiment. I agree with Violet about records for zines going far beyond your institution. If your zine records also live in WorldCat, then there's an additional functionality question—if a user doing a search in WorldCat (or many other interfaces) clicks on a subject heading or on a subject facet that is generated by LCSH, they won't retrieve works on that subject that don't have LCSH terms assigned. Records without them are absented from one possible avenue of discovery. The other thing that comes to mind is authorities functionality, and automatic batch updating/flipping. Language is a moving target, and terms in any vocabulary are subject to change over time. Controlled vocabulary requires ongoing updating and maintenance, that's a built-in part of the endeavor. At most institutions, in most systems, LCSH is far more likely to be supported and maintained in this way than any other CV or locally assigned terms. US flight or flight is a great analogy, and a question I'm also debating. I might take flight if a Trump presidency comes to pass. I think comparisons to Hitler are not an exaggeration, nor are the possibilities of a violent coup or civil war. Am I a jerk for wanting to leave the belly of the beast? Am I wrong to thing that massive one-size-fits-no-one thesauruses times have passed? Probably! While I'm not sure that the change was ideal, I do understand the distinction they are making (not all noncitizens are immigrating). LC's use of terminology from the disciplines when possible is usually a good idea. As a cataloger (who is on vacation as this is happening and so not too inclined to look at it too deeply yet) I am a little leery of changing one heading to two, since presumably some works with the old heading will not use both new headings (or else why make the distinction?). I tend not to think it was a face-saving posture, but I tend to give people the benefit of the doubt, even if I disagree with them. As to LC headings reflecting Congress' usage, I never heard that and sincerely hope it's not true. Especially in the past 15 or 20 years it has become a horrible language game on the Hill. Anyway I would definitely not give up on a controlled vocabulary, and LCSH is a very good one. The biased language is slowly being fixed. Some terms we use today will be considered offensive or perjorative in the future, no matter what. Language changes. 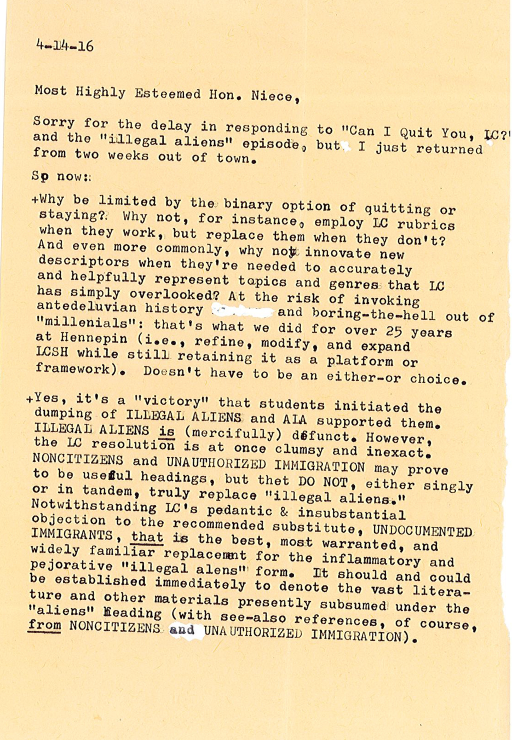 If you are not already aware of the listsrv "Rad-cat" (radical cataloging) you might want to check it out. There are a lot of catalogers there who strategize on fixing LCSH, or at least raise awareness of specific terms, among other things. Thanks for this post. I, too, didn't read closely so did not realize how weaselly LC has been about the change. In my (limited) experience cataloging the zines for our collection [at Simmons], I've often been frustrated with trying to express the subject matter using LCSH, and finding appropriate headings for the keywords Dawn [Stahura] supplies. I don't put the records up on OCLC, but I do think it's worth trying to use LCSH as much as possible, for the purpose of subject collocation of both zine and non-zine resources. That being said, I've just started a list of local subject headings, mostly based on the work with the zines, but available for other resources as well. And of course, we do have the fantastic summaries written by Dawn for keyword searches. She's also very interested in other ways to enhance subject access. Maybe we can talk about that this summer. In case you're wondering I am not Sandy's actual niece, not that I wouldn't love to be. I took to calling him my avuncle because he is an avuncular family friend.